In 98 of the 100 largest metro areas in the United States, it is cheaper to buy than to rent with a 30-year fixed rate mortgage, according to a recent report done by Trulia. 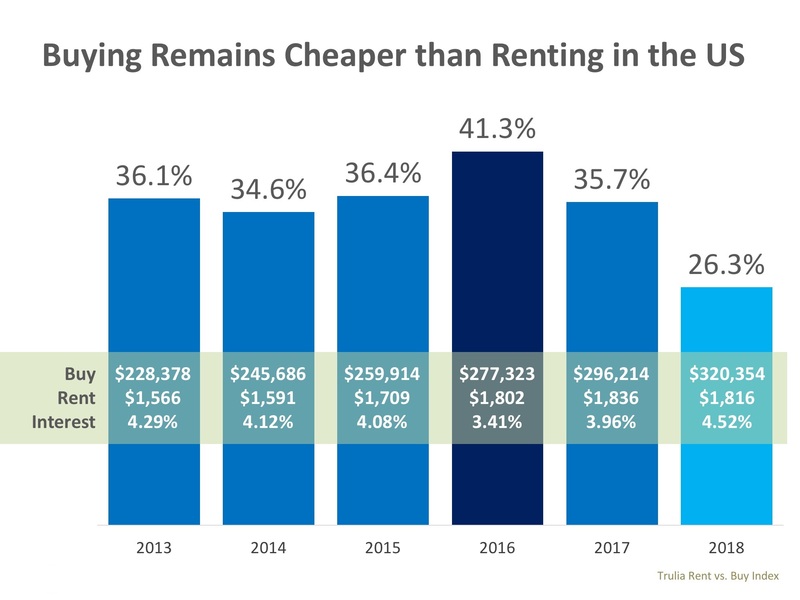 This report is the Rent vs Buy report. The 97 of the 98 metro areas are on a double digit advantage when it comes to how cheap it is to buy vs rent. The map below shows the metro areas that were studies and how cheap it is to buy rather than rent. The darker the blue, the cheaper it is. 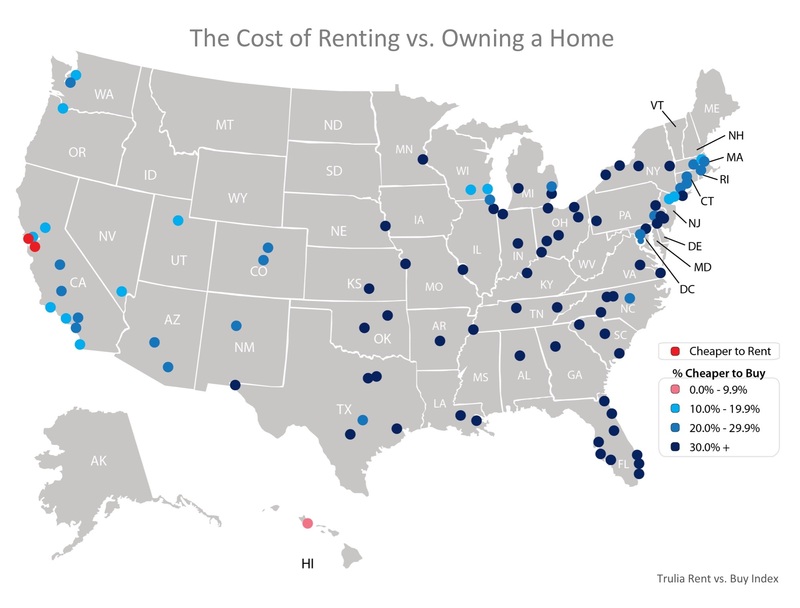 Here’s how Trulia calculates the true cost of rent vs buying. Trulia includes all assumed renting costs, including one-time costs (like security deposits), and compares them to the monthly costs of owning a home (insurance, mortgage payments, taxes, and maintenance) including one-time costs (down payments, closing costs, sale proceeds). 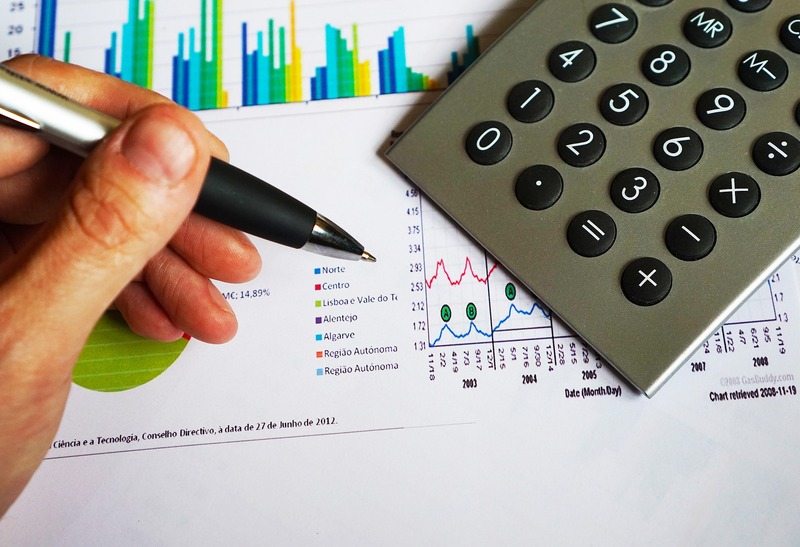 They also assume that households stay in their home for seven years, put down a 20% down payment, and take out a 30-year fixed rate mortgage. It shows the impact of the median home price, rental price, and 30-year fixed rate interest rate used to calculate the ‘cheaper to buy’ metric. The average mortgage rate back in 2016 was the driving force for making it 41.3% cheaper to buy a home. Rates have been the highest in six years but buying a home remains cheaper. Aside from being cheaper than renting, owning your own home has a lot of advantages. Home values are always rising and you wouldn’t want to miss out on equity.